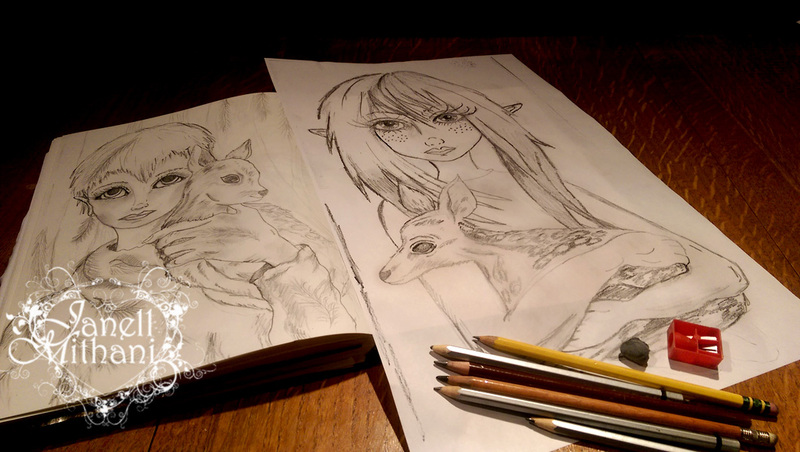 This entry was posted in Art and tagged drawing, fairy, Fawn, sketch. Bookmark the permalink. ← Birds and Fairies…Finished Painting! They both look great, Janell. I was especially drawn to the one on the left. I’ll look forward to the finished paintings. Thanks, Jill. I am looking froward to painting them. Thank so much, yes they do seem to tell a story. Really sweet! Looking forward to seeing the finished paintings. Thanks, Susan. Working on them today. You are so funny, Jonathan. I always enjoy your comments and appreciate you re-blogging my posts. 🙂 Have a great weekend! AND I APPRECIATE YPOU AND YOUR ART! Thanks and I will read your poems. These two will be a hit – love the concept and design. Can’t wait to see the finished paintings. Love the deer in the sketches with the Fairies! Thanks, Liz. I am working on the painting of the one with short hair today. I like your style. It is mysterious and has a classic feel that reminds me of Shakespeare.